Its always fun to find a gardening surprise when you least expect it. 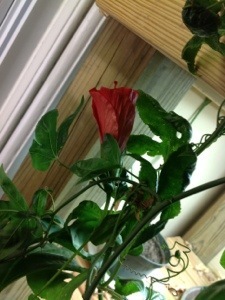 I came home last night to find a surprise blossom opening on the Hibiscus in my indoor gardening area. It had eluded my notice somehow. 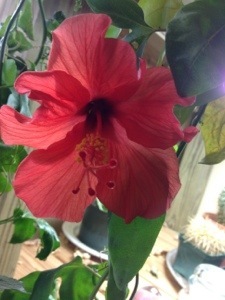 This Hibiscus originated from a cutting off a larger tree, several years ago I rooted the cutting and it’s become a low-maintenance houseplant. Organic houseplant care can be trickier than outdoor organic gardening, but so worth it to see colorful blooms in December! 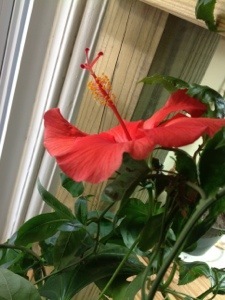 I have been using organic Rapadura sugar as an organic bloom boost fertilizer for my houseplants. That’s my favorite kind of holiday surprise, and it doubles as a Christmas decoration! Maybe this year I’ll string some lights on it. 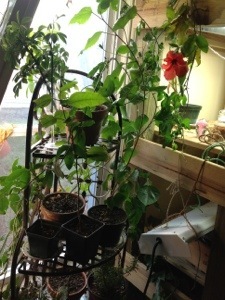 After more than a decade of organic indoor gardening, I prefer my houseplants to be tough. “Sink or swim,” I tell every new plant I bring home. Low maintenance is a virtue next to usefulness. And somehow it comes together.